This guide walks through how to localize your Microsoft Edge extension so that it's ready for multiple locales upon release. To fully localize your extension, you'll need to follow the steps for both Windows and the Microsoft Store. If you want to localize your extension resources for Microsoft Edge, you can learn how to use the i18n framework in the Internationalization guide. If your extension doesn't support multiple languages, you can skip to Localizing name and description in the Microsoft Store. The first step towards getting your extension available to a wide audience is to configure its AppxManifest for multiple languages. In the Microsoft Store, this will show users what languages your extension supports. Certain fields in the AppxManifest will also need to be changed if you want the name of your extension to be localized in the Windows UI and the Microsoft Store. Once your AppxManifest is configured, you'll need to create JSON string resources for the languages that you indicated as supported. This requires creating a .resjson file for each language, where each file has all the UI strings of that language within it. After the .resjson files for the supported languages have been made, a .pri resource file will need to be created. This will be created by using a configuration file to the MakePRI tool that comes with the Windows 10 SDK. If you are only downloading the Windows 10 SDK to use the MakePri.exe tool, you can select only the "Windows SDK Signing Tools for Desktop Apps" and "Windows SDK for UWP Managed Apps" features to keep the download lighter. The MakePri.exe tool will appear in subfolders of C:\Program Files (x86)\Windows Kits\10\bin\10.0.17713.0. Once you've uploaded your extension, the final step is to localize the name and description in the Microsoft Store. Submitting a Microsoft Edge extension to the Microsoft Store is currently a restricted capability. Reach out to us with your requests to be a part of the Microsoft Store, and we’ll consider you for a future update. Your extension's "Supported languages" list in the Microsoft Store is generated based on its AppXManifest values. This list is specified using the Resource element. See Supported languages for info on the languages/language codes that the Microsoft Store supports. In order to specify localized strings for all publically visible elements in the AppxManifest, you'll have to use a resource identifier in the format of ms-resource:<resource id>. 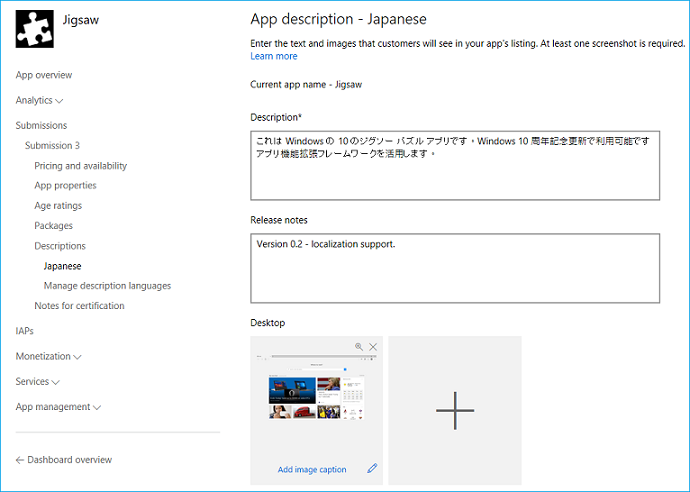 Now that your AppxManifest is configured for multiple languages, there are some key differences you should know between localizing the UI within your extension and localizing your extension for Windows and the Microsoft Store. The name of the extension that shows up in the Settings app in Windows comes from the AppXManifest. If this value is hardcoded in English, the English version of the name will show up on non-English Windows devices. If the branding of your extension is English only, it's ok to leave it hardcoded. 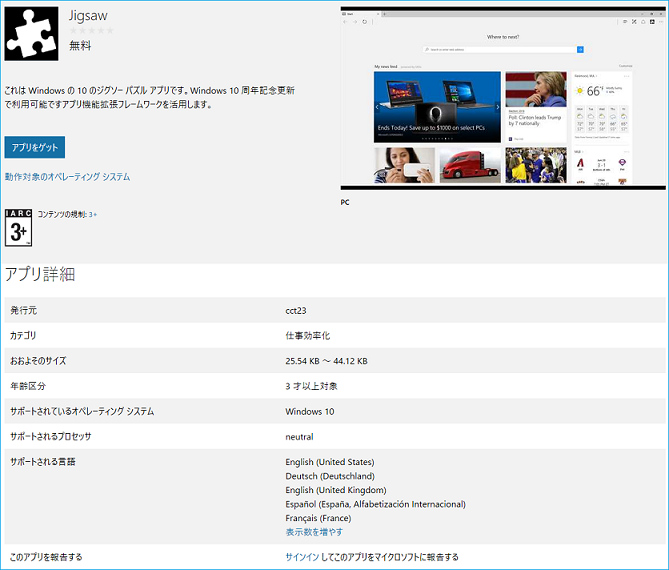 Outside of Microsoft Edge, within Windows and the Microsoft Store, the only supported localization framework is based on the Universal Windows Platform (UWP) localization framework. Resources are specified in .resjson files instead of .json files. The locales supported should be specified in the AppXManifest file, with the first locale being the default locale. The name/value pair denoted by an underscore are comments for the corresponding string resource. .resjson files are compiled into .pri files which must be included during AppX package creation. With a configured AppxManifest in hand and the differences between the i18n and UWP localization frameworks highlighted, you're ready to create your resource files. "_DisplayName.comment"     : "Name of extension." Once you've created all your .resjson files, you're ready to create your package resource index (PRI) file. This file stores the resources for all your supported languages. To do this you can use the MakePRI tool which is included with the Windows 10 SDK. Now you can use the configuration file and the MakePRI tool to create the resources.pri file. For this example, the root location for the project will be [Root folder]. Once you try to upload your complete, localized package, the Windows Dev Center will detect that more than one language is supported and check that you have corresponding localized names and descriptions for each. If any of the localized values are missing, your submission will be blocked until you provide the values. If you are only interested in providing a localized name and description for the Microsoft Store (and not Windows), you can do so by reserving all the localized names for your extension. 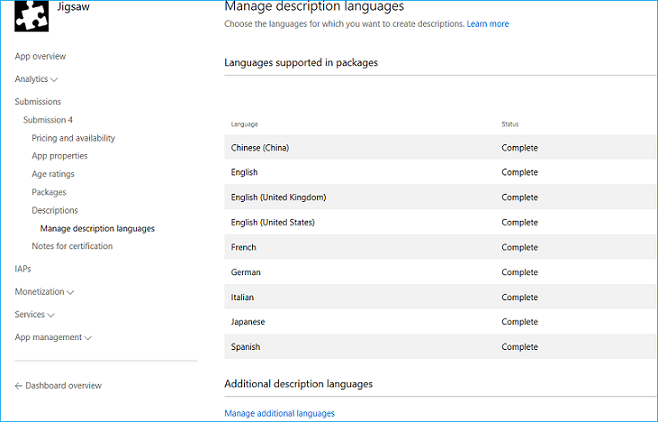 Once you've selected "Manage additional languages", you'll get to select which languages you want to add to your Microsoft Store listing. The new language will show up as 'Additional description language' in the "Description" section. The following example shows an AppxManifest that isn't localized, and only supports the "en-us" locale. Description="This is a jigsaw puzzle app"